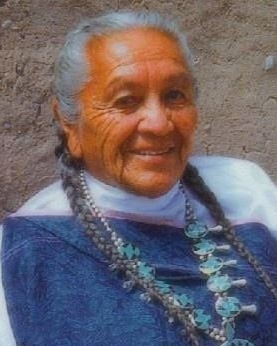 The Tewa, also known as Tano, are a Pueblo Native American people who reside in southwestern United States. Six Tewa pueblos are located adjacent to the Rio Grande in central/north-central New Mexico and one is located on a mesa in northeastern Arizona. The New Mexico Tewa pueblos are San Juan Pueblo, Santa Clara Pueblo, San Ildefonso Pueblo, Tesuque Pueblo, Pojoaque Pueblo, and Nambe Pueblo. The Arizona Pueblo, referred to as Hopi-Tewa because their culture is similar to the Hopi, Hopitu-Shinumu residing on the First Mesa in the village of Hano. The Tewa lived in New Mexico until they fled following the 1696 Pueblo Revolt. The Tewa are culturally structured into matrilineal clans, meaning they inherit or determine descent through the female line. Religiously, life in the Pueblos is "involves attribution of the sacred to, and respect and reverence for, the earth (from which all people come and to which all people return), the mountains (where dwell the spirits of the Towa'e, or founding brothers of the Tewa), the hills, water, and certain animals, birds, and plants. Polytheism is present in the form of belief in a range of supernatural spiritual forces and entities; because of this, Catholicism over the past two hundred years or so has come to fit easily within the native religious framework" (Encyclopedia.com - Tewas Pueblos). Pray that God will breakdown social and religious barriers that prevent Tewa from experiencing God's free gift of eternal and abundant life found in Jesus Christ. Pray Christian will share with boldness and a contextualized Gospel message to the Tewa.